They are evidence that your members/learners need more than stand-alone events. Focusing solely on “programs” — the way we’ve traditionally provided education to our association members — is just not enough. Jay was the first to address the need to focus on the power and importance of infomal learning — 80-90% of the way someone learns what they need to know professionally is learned informally. And of course, if we attract or pull our members into the learning environment we have created for them, then we have most of the battle won — our marketing is that much more effective, our registrations hit the required levels to meet our budgets, our members stay engaged and are that much more likely to renew…. Programs have their place, but they are a means — not and end — to your curriculum. When you’re considering venturing into elearning for the first time or expanding your offerings, you’re always looking at an investment. And as a responsible steward of your association’s budget, you want to make sure your investments are sound and your justifications for those expenditures are solid. If they’re not, the board of directors will never approve them, right? And even if they did, you’d toss and turn at night, wondering what you’ve gotten yourself into. Two new resources are now available to help you! Tagoras has just released a condensed version of its Association E-learning: State of the Sector report. In 61 pages you’ll get the key data from a survey of nearly 500 trade and professional associations about their e-learning activities. Available at just $99, this sort of research at this price is unheard of — and aLearning commends Tagoras for their willingness to make their study available at a more affordable cost without loss of value. What does the report mean to you? Benchmarking. Examples. Contacts. Case studies. More than that, you’ll discover what your options are. You probably have more elearning possibilities than you think. Options are everything. Examples and a proven track record to support them are priceless. 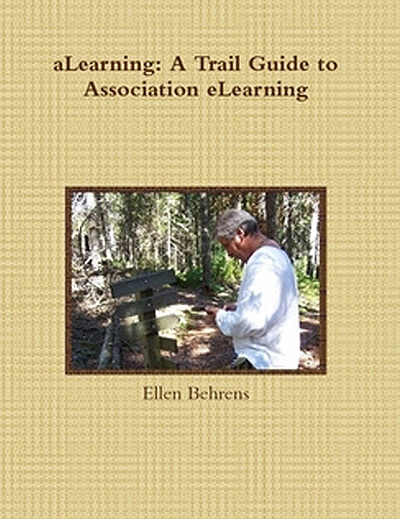 And for guidance on what to do with those options — how to fit elearning effectively into a full education curriculum and create an elearning strategy, you of course need to get a copy of (warning: shameless plug ahead) aLearning: A Trail Guide to Association eLearning. At just $25 for a downloadable copy or $35 (plus shipping) for a printed version, you won’t find another resource as packed with examples and how-to information on this topic anywhere. To learn more about the book or to order your copy of aLearning, just click the blue and orange “Buy Now – Lulu” button on the left. Together the two resources will cost you less than $140 — a small price to pay when you’re considering spending thousands in software, hardware, consulting, and other services and products. Go into the process of building your elearning program as informed as you can be. Build credibility for yourself and support for your initiative. Don’t wait. Just discovered the Upside Learning blog and knew right away I wanted to share what Amit has to say about selecting an LMS. Take a look at Five Things Not to Do While Selecting an LMS. Great advice from someone who knows the tech side of elearning much better than I do! It’s simple, really: what if the information you’re getting isn’t reliable? Don’t we teach others this very thing about accessing information, gaining knowledge, from the Internet? That you have to be careful about the source, that you need to be able to evaluate the validity of what you’ve found out there in cyberspace? What will we do to be sure our collaborative learning spaces aren’t populated by those who think they know more than they do? And herein we have an example of the very issue: if I don’t know who Richard Whatley is, should I risk sharing the quote? Am I — ignorantly — passing on something that’s of no value or maybe even harmful? Isn’t this the danger of collaborative learning? That those who don’t know — who are in fact, in the space because they need to learn something — won’t recognize misinformation? Haven’t we all seen it at some time or another on forums and in blogs: a great post with some good comments that add to the original thought, then someone’s additional comments that go way off somewhere, maybe including false or misleading information? But don’t we also say that the best blogs are the “opinion blogs”? Are we advancing ignorance by sharing our opinions? Do we risk misleading people by sharing more opinions than science or fact? How do you propose we manage the collaborative learning environment to provide a place for opinion-sharing? To temper the loud but uninformed voices that could mislead or misinform? Haven’t you been in one of those team projects where the weakest member pulled everyone down, risking the project? Or how about back in school — those group projects with your schoolmates where you were all going to get the same grade? They either left most of the work to you, or maybe you took it on because you were afraid for your grade? Why are we so sure that others won’t have similar collaborative learning experiences — some good, some not so good? What are we doing to ensure our collaborative learning spaces will be good ones? Way back in my 20s, I remember reading advice to young women who dreamed of breaking the corporate glass ceiling. Along with dressing for success, we were advised to hone our memories and resist the temptation to carry paper and pens into meetings to avoid being the automatic choice for note-taker. Oh, yes, my young female colleague, that was back in the day when men were made to classes teaching them to look female co-workers in the eyes, not in the chest. Some bosses took at least one of the many computer courses that came out specifically designed for the “executive” or “manager.” As we trainers know, this is an effective way of creating a safe environment where the boss could try new things and fail without embarrassment. We also know some of the bosses just didn’t show up. They refused to learn the computer, refused to take the classes. Maybe they couldn’t get past the fear they could fail at something which so many others were succeeding at. Maybe they figured if they didn’t learn how to use that darn thing they would get their secretary back. Maybe they simply lived in denial: ignore that PC and it would eventually go away. Sound familiar? Though more and more associations are buying into the need to incorporate more elearning into their education curriculums, there’s still plenty of denial floating around. In his post, “Down But Not Quite Out,” learning and performance specialist Charles Jennings describes how the increased accessibility of training, articles, information — even jokes — on the Web are undoing Learning Tree and Reader’s Digest, two venerable business models now in jeopardy. Here’s what I think is happening: Learning Tree and Reader’s Digest are like typists in steno pools. Learning Tree, like it or not, is just another training provider in a pool of many others. And just as the PC obliterated the need for the steno pool, the Web and the availability of easily accessible elearning could obliterate the face-to-face training companies as well. Though steno pools are gone, some people do still dictate and others still transcribe that dictation. Face-to-face training companies won’t entirely go away, either. Those that stay in business will owe that success to their ability to adapt, to deliver on their strengths and promise, and to provide something essential and valuable. All in a business model that will provide their clients with affordable solutions served up with excellent customer service.